"WEF" redirects here. For other uses, see WEF (disambiguation). 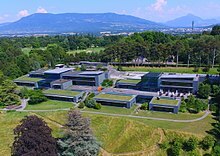 The World Economic Forum (WEF), based in Cologny-Geneva, Switzerland, was founded in 1971 as a not-for-profit organization. It gained formal status in January 2015 under the Swiss Host-State Act, confirming the role of the Forum as an International Institution for Public-Private Cooperation. The Forum's mission is cited as "committed to improving the state of the world by engaging business, political, academic, and other leaders of society to shape global, regional, and industry agendas". The WEF hosts an annual meeting at the end of January in Davos, a mountain resort in Graubünden, in the eastern Alps region of Switzerland. The meeting brings together some 2,500 business leaders, international political leaders, economists, celebrities and journalists for up to four days to discuss the most pressing issues facing the world. The organization also convenes some six to eight regional meetings each year in locations across Africa, East Asia and Latin America, and holds two further annual meetings in China, India and the United Arab Emirates. Beside meetings, the organization provides a platform for leaders from all stakeholder groups from around the world – business, government and civil society – to come together. It also produces a series of research reports and engages its members in sector-specific initiatives. There have been many other international conferences nicknamed with "Davos". However, the World Economic Forum objected the use of "Davos" in such contexts for any event not organised by them. This particular statement was issued on 22 October 2018, a day before the opening of 2018 Future Investment Initiative (nicknamed "Davos in the desert") organised by the Public Investment Fund of Saudi Arabia. The economics expert Prime-Minister Meles Zenawi, being a panelist at World Economic Forum on 2012. The WEF was founded in 1971 by Klaus Schwab, a business professor at the University of Geneva. First named the "European Management Forum", it changed its name to the World Economic Forum in 1987 and sought to broaden its vision to include providing a platform for resolving international conflicts. In the summer of 1971, Schwab invited 444 executives from Western European firms to the first European Management Symposium held in the Davos Congress Centre under the patronage of the European Commission and European industrial associations, where Schwab sought to introduce European firms to American management practices. He then founded the WEF as a nonprofit organization based in Geneva and drew European business leaders to Davos for the annual meetings each January. Schwab developed the "stakeholder" management approach, which attributed corporate success to managers actively taking account of all interests: not merely shareholders, clients, and customers, but also employees and the communities within which the firm is situated, including governments. 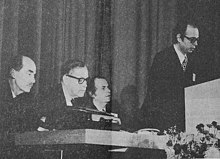 Events in 1973, including the collapse of the Bretton Woods fixed-exchange rate mechanism and the Arab–Israeli War, saw the annual meeting expand its focus from management to economic and social issues, and, for the first time, political leaders were invited to the annual meeting in January 1974. Political leaders soon began to use the annual meeting as a neutral platform. The Davos Declaration was signed in 1988 by Greece and Turkey, helping them turn back from the brink of war. 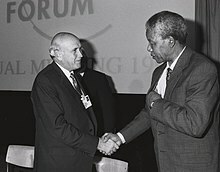 In 1992, South African President F. W. de Klerk met with Nelson Mandela and Chief Mangosuthu Buthelezi at the annual meeting, their first joint appearance outside South Africa. At the 1994 annual meeting, Israeli Foreign Minister Shimon Peres and PLO chairman Yasser Arafat reached a draft agreement on Gaza and Jericho. In late 2015, the invitation was extended to include a North Korean delegation for the 2016 forum, "in view of positive signs coming out of the country", the WEF organizers noted. North Korea has not been attending the WEF since 1998. The invitation was accepted but after the January 2016 North Korean nuclear test on 6 January, the invitation was revoked, and the country's delegation was made subject to "existing and possible forthcoming sanctions". Despite protests by North Korea calling the decision by the WEF managing board a "sudden and irresponsible" move, the WEF committee maintained the exclusion because "under these circumstances there would be no opportunity for international dialogue". In 2017, the World Economic Forum in Davos attracted considerable attention when for the first time, a head of state from the People's Republic of China was present at the alpine resort. With the backdrop of Brexit, an incoming protectionist US administration and significant pressures on free trade zones and trade agreements, President Xi Jinping defended the global economic scheme, and portrayed China as a responsible nation and a leader for environmental causes. He sharply rebuked the current populist movements that would introduce tariffs and hinder global commerce, warning that such protectionism could foster isolation and reduced economic opportunity. In 2018, Indian Prime Minister Narendra Modi gave the plenary speech, becoming the first head of state from India to deliver the inaugural keynote for the annual meet at Davos. Modi highlighted climate change, terrorism and protectionism as the three major global challenges, and expressed confidence that they can be tackled with collective effort. In 2019, Brazilian President Jair Bolsonaro gave the keynote address at the plenary session of the conference. On his first international trip to Davos, he emphasized liberal economic policies despite his populist agenda, and attempted to reassure the world that Brazil is a protector of the rain forest while utilizing its resources for food production and export. He stated that "his government will seek to better integrate Brazil into the world by mainstreaming international best practices, such as those adopted and promoted by the OECD". Environmental concerns like extreme weather events, and the failure of climate-change mitigation and adaptation were among the top-ranking global risks expressed by WEF attendees. Headquartered in Cologny, the WEF also has offices in New York, Beijing and Tokyo. On October 10, 2016, the Forum announced the opening of its new Center for the Fourth Industrial Revolution in San Francisco. According to the Forum, the center will "serve as a platform for interaction, insight and impact on the scientific and technological changes that are changing the way we live, work and relate to one another". The World Economic Forum strives to be impartial and is not tied to any political, partisan, or national interests. The foundation is "committed to improving the State of the World". Until 2012, it had observer status with the United Nations Economic and Social Council; it is under the supervision of the Swiss Federal Council. The foundation's highest governance body is the foundation board. The Forum is chaired by Founder and Executive Chairman Professor Klaus Schwab and is guided by a Board of Trustees that is made up of leaders from business, politics, academia and civil society. Members of the Board of Trustees include: Peter Brabeck-Letmathe, H.M. Queen Rania Al Abdullah of Jordan, Mukesh Ambani, Marc Benioff, Mark Carney, Orit Gadiesh, Al Gore, Herman Gref, Angel Gurría, André Hoffmann, Jim Yong Kim, Christine Lagarde, Ursula von der Leyen, Yo-Yo Ma, Peter Maurer, Luis Alberto Moreno, Indra Nooyi, L. Rafael Reif, Jim Hagemann Snabe, Heizo Takenaka, and Min Zhu. The Managing Board is chaired by the Forum's President, Børge Brende, and acts as the executive body of the World Economic Forum. Managing Board members are W. Lee Howell, Jeremy Jurgens, Cheryl Martin, Adrian Monck, Philipp Rösler, Richard Samans, Olivier Schwab, Murat Sönmez and Alois Zwinggi. 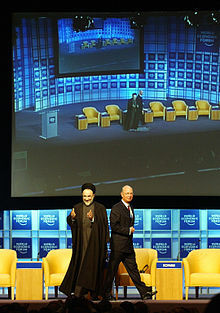 Erdoğan walks out of the session at the World Economic Forum in 2009. The foundation is funded by its 1,000 member companies, typically global enterprises with more than five billion dollars in turnover (varying by industry and region). These enterprises rank among the top companies within their industry and/or country and play a leading role in shaping the future of their industry and/or region. Membership is stratified by the level of engagement with forum activities, with the level of membership fees increasing as participation in meetings, projects, and initiatives rises. In 2011 an annual membership cost $52,000 for an individual member, $263,000 for "Industry Partner" and $527,000 for "Strategic Partner". An admission fee cost $19,000 per person. In 2014, WEF raised annual fees by 20 percent, making the cost for "Strategic Partner" from CHF 500,000 ($523,000) to CHF 600,000 ($628,000). 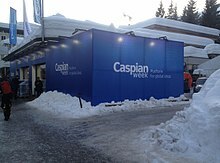 A sports shop has turned into a temporary informal reception location "Caspian week", WEF 2018. 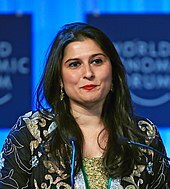 The flagship event of the World Economic Forum is the invitation-only annual meeting held at the end of January in Davos, Switzerland, bringing together chief executive officers from its 1,000 member companies, as well as selected politicians, representatives from academia, NGOs, religious leaders, and the media in an alpine environment. The winter discussions focus around key issues of global concern (such as the globalization, capital markets, wealth management, international conflicts, environmental problems and their possible solutions). The town is small enough to allow participants to meet anywhere outside the sessions and allows them the greatest opportunities to attend receptions organized by companies and countries. The participants are also taking part in role playing events, such as the Investment Heat Map. Informal winter meetings may have led to as many ideas and solutions as the official sessions. At the 2018 annual meeting, more than 3,000 participants from nearly 110 countries participated in over 400 sessions. Participation included more than 340 public figures, including more than 70 heads of state and government and 45 heads of international organizations; 230 media representatives and almost 40 cultural leaders were represented. As many as 500 journalists from online, print, radio, and television take part, with access to all sessions in the official program, some of which are also webcast. Not all the journalists are given access to all areas, however. This is reserved for white badge holders. "Davos runs an almost caste-like system of badges", according to BBC journalist Anthony Reuben. "A white badge means you're one of the delegates – you might be the chief executive of a company or the leader of a country (although that would also get you a little holographic sticker to add to your badge), or a senior journalist. An orange badge means you're just a run-of-the-mill working journalist." 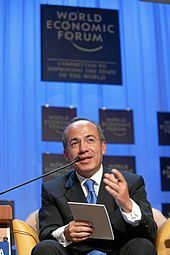 In 2011, some 250 public figures (heads of state or government, cabinet ministers, ambassadors, heads or senior officials of international organizations) attended the annual meeting, including: Felipe Calderón, Robert B. Zoellick, Álvaro Uribe Vélez, Nicolas Sarkozy, Ban Ki-moon, Angela Merkel, Oommen Chandy, N. Chandrababu Naidu, Ferenc Gyurcsány, François Fillon, Morgan Tsvangirai, Gordon Brown, David Cameron, Min Zhu, Paul Kagame, Queen Rania of Jordan, Dmitry Medvedev, Susilo Bambang Yudhoyono, Kevin Rudd, Barney Frank, Kofi Annan, Werner Faymann, Leonel Fernández, Jacob Zuma, Cyril Ramaphosa Naoto Kan, Jean-Claude Trichet, and Zeng Peiyan. In 2007, the foundation established the Annual Meeting of the New Champions (also called Summer Davos), held annually in China, alternating between Dalian and Tianjin, bringing together 1,500 participants from what the foundation calls Global Growth Companies, primarily from rapidly growing emerging countries such as China, India, Russia, Mexico, and Brazil, but also including quickly growing companies from developed countries. The meeting also engages with the next generation of global leaders from fast-growing regions and competitive cities, as well as technology pioneers from around the globe. The Chinese Premier has delivered a plenary address at each annual meeting. Every year regional meetings take place, enabling close contact among corporate business leaders, local government leaders, and NGOs. Meetings are held in Africa, East Asia, Latin America, and the Middle East. The mix of hosting countries varies from year to year, but consistently China and India have hosted throughout the decade since 2000. The group's Forum of Young Global Leaders consists of 800 people chosen by the forum organizers as being representative of contemporary leadership, "coming from all regions of the world and representing all stakeholders in society", according to the organization. After five years of participation they are considered alumni. Since 2000, the WEF has been promoting models developed by those in close collaboration with the Schwab Foundation for Social Entrepreneurship, highlighting social entrepreneurship as a key element to advance societies and address social problems. Selected social entrepreneurs are invited to participate in the foundation's regional meetings and the annual meetings where they may meet chief executives and senior government officials. At the Annual Meeting 2003, for example, Jeroo Billimoria met with Roberto Blois, deputy secretary-general of the International Telecommunication Union, an encounter that produced a key partnership for her organization Child helpline international. The foundation also acts as a think tank, publishing a wide range of reports. In particular, "Strategic Insight Teams" focus on producing reports of relevance in the fields of competitiveness, global risks, and scenario thinking. The "Competitiveness Team" produces a range of annual economic reports (first published in brackets): the Global Competitiveness Report (1979) measured competitiveness of countries and economies; The Global Information Technology Report (2001) assessed their competitiveness based on their IT readiness; the Global Gender Gap Report examined critical areas of inequality between men and women; the Global Risks Report (2006) assessed key global risks; the Global Travel and Tourism Report (2007) measured travel and tourism competitiveness; the Financial Development Report (2008) aimed to provide a comprehensive means for countries to establish benchmarks for various aspects of their financial systems and establish priorities for improvement; and the Global Enabling Trade Report (2008) presented a cross-country analysis of the large number of measures facilitating trade among nations. The "Risk Response Network" produces a yearly report assessing risks which are deemed to be within the scope of these teams, have cross-industry relevance, are uncertain, have the potential to cause upwards of US$10 billion in economic damage, have the potential to cause major human suffering, and which require a multi-stakeholder approach for mitigation. The Global Health Initiative was launched by Kofi Annan at the annual meeting in 2002. The GHI's mission was to engage businesses in public-private partnerships to tackle HIV/AIDS, tuberculosis, malaria, and health systems. The Global Education Initiative (GEI), launched during the annual meeting in 2003, brought together international IT companies and governments in Jordan, Egypt, and India that has resulted in new personal computer hardware being available in their classrooms and more local teachers trained in e-learning. This is having a significant effect on the lives of children. The GEI model, which is scalable and sustainable, now is being used as an educational blueprint in other countries including Rwanda. The Environmental Initiative covers climate change and water issues. Under the Gleneagles Dialogue on Climate Change, the U.K. government asked the World Economic Forum at the G8 Summit in Gleneagles in 2005 to facilitate a dialogue with the business community to develop recommendations for reducing greenhouse gas emissions. This set of recommendations, endorsed by a global group of CEOs, was presented to leaders ahead of the G8 Summit in Toyako and Hokkaido held in July 2008. The Water Initiative brings together diverse stakeholders such as Alcan Inc., the Swiss Agency for Development and Cooperation, USAID India, UNDP India, Confederation of Indian Industry (CII), Government of Rajasthan, and the NEPAD Business Foundation to develop public-private partnerships on water management in South Africa and India. In an effort to combat corruption, the Partnering Against Corruption Initiative (PACI) was launched by CEOs from the Engineering and Construction, Energy and Metals, and Mining industries at the annual meeting in Davos during January 2004. PACI is a platform for peer exchange on practical experience and dilemma situations. Approximately 140 companies have joined the initiative. The Environment and Natural Resource Security Initiative was emphasized for the 2017 meeting to achieve inclusive economic growth and sustainable practices for global industries. With increasing limitations on world trade through national interests and trade barriers, the WEF has moved towards a more sensitive and socially minded approach for global businesses with a focus on the reduction of carbon emissions in China and other large industrial nations. In January 2017, WEF launched the Platform for Accelerating the Circular Economy (PACE), which is a global public private partnership seeking to scale circular economy innovations. PACE is co-chaired by Frans van Houten (CEO of Philips), Naoko Ishii (CEO of the Global Environment Facility, and the head of UN Environment (UNEP). The Ellen MacArthur Foundation, the International Resource Panel, Circle Economy and Accenture serve as knowledge partners. On 19 January 2017 the Coalition for Epidemic Preparedness Innovations (CEPI), a global initiative to fight epidemics, was launched at the forum in Davos. The internationally funded initiative aims at securing vaccine supplies for global emergencies and pandemics, and to research new vaccines for tropical diseases, that are now more menacing. The project is funded by private and governmental donors, with an initial investment of US$460m from the governments of Germany, Japan and Norway, plus the Bill & Melinda Gates Foundation and the Wellcome Trust. Also in 2017, WEF launched the Fourth Industrial Revolution (4IR) for the Earth Initiative, a collaboration among WEF, Stanford University and PwC, and funded through the Mava Foundation. In 2018, WEF announced that one project within this initiative was to be the Earth BioGenome Project, the aim of which is to sequence the genomes of every organism on Earth. The Network of Global Future Councils meets annually in the United Arab Emirates and virtually several times a year. The second WEF annual meeting was held in Dubai in November 2017, when there were 35 distinct councils focused on a specific issue, industry or technology. In 2017 members met with representatives and partners of the Forum's new Center for the Fourth Industrial Revolution. Ideas and proposals are taken forward for further discussion at the World Economic Forum Annual Meeting in Davos-Klosters in January. 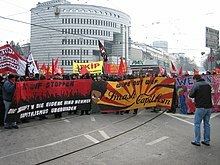 Protest march against the WEF in Basel, 2006. The Transnational Institute describes the World Economic Forum's main purpose as being "to function as a socializing institution for the emerging global elite, globalization's "Mafiocracy" of bankers, industrialists, oligarchs, technocrats and politicians. They promote common ideas, and serve common interests: their own." A study, published in the Journal of Consumer Research, investigated the sociological impact of the WEF. It concluded that the WEF do not solve issues such as poverty, global warming, chronic illness, or debt. They have simply shifted the burden for the solution of these problems from governments and business to "responsible consumers subjects: the green consumer, the health-conscious consumer, and the financially literate consumer." They merely reframe the issues, and by so doing perpetuate them. Al Gore is singled out as a prime example. Gore's speeches deliberately shift focus away from the problems of unregulated markets and corporate activities to one of moral pathologies, individual greed, etc. In doing so he is actually promoting the creation of new markets, and hence perpetuating the same old problems in a new guise. New markets will follow the same patterns as the old ones because the core problem of corporate governance is never addressed. During the late 1990s the foundation, along with the G7, World Bank, World Trade Organization, and International Monetary Fund, came under heavy criticism by anti-globalization activists who claimed that capitalism and globalization were increasing poverty and destroying the environment. Ten thousand demonstrators disrupted the World Economic Forum in Melbourne, obstructing the path of two hundred delegates to the meeting. Repeatedly, demonstrations are held in Davos (see Anti-WEF protests in Switzerland, January 2003) to protest against what have been called the meetings of "fat cats in the snow", a tongue-in-cheek term used by rock singer Bono. After 2014, the protest movement against the World Economic Forum has largely died down, and Swiss police noted a significant decline in attending protesters, 20 at most during the meeting in 2016. While protesters are still more numerous in large Swiss cities, the protest movement itself has undergone significant change. Around 150 Tibetans and Uighurs protested in Geneva and 400 Tibetans in Bern against the visit of the Chinese President Xi for the 2017 meeting, with subsequent confrontations and arrests. The WEF attracts a number of non-governmental organisations, including the World Wildlife Fund, Amnesty International, ICRC and Elders. In 2014, Winnie Byanyima, the executive director of the anti-poverty confederation Oxfam International, was invited to serve as co-chair for the 2015 meeting, where she presented a critical report of global wealth distribution based on statistical research by the Credit Suisse Research Institute. In this study, the richest one per cent of people in the world own forty-eight per cent of the world’s wealth. At the 2019 meeting, the Oxfam director presented another report claiming that the gap between rich and poor has only increased. The report “Public Good or Private Wealth” stated that 2,200 billionaires worldwide saw their wealth grow by 12 percent while the poorest half saw its wealth fall by 11 percent. Oxfam calls for a global tax overhaul to increase and harmonise global tax rates for corporations and wealthy individuals. In January 2000, a thousand protesters marched through the streets of Davos and smashed the window of the local McDonald's restaurant. The tight security measures around the campus of Davos have kept demonstrators from the Alpine resort, and most demonstrations were held in Zürich, Bern, or Basel. The costs of the security measures, which are shared by the foundation and the Swiss cantonal and national authorities, have been criticized in the Swiss national media. In September of 2018, the city of Davos approved by popular vote to increase the security budget for the yearly meeting to CHF 1.125 million. Later that month, the Swiss house of representatives (Nationalrat) also agreed to increase police and military expenditures to CHF 39 million while the Kanton of Graubünden is contributing 2.25 million, the same amount the WEF is paying for security costs. Since the annual meeting in January 2003 in Davos, an Open Forum Davos, co-organized by the Federation of Swiss Protestant Churches, is held concurrently with the Davos forum, opening up the debate about globalization to the general public. The Open Forum has been held in the local high school every year, featuring top politicians and business leaders. It is open to all members of the public free of charge. The annual meeting of the forum also has been decried as a "mix of pomp and platitude" and criticized for moving away from serious economics and accomplishing little of substance, particularly with the increasing involvement of NGOs that have little or no expertise in economics. Instead of a discussion on the world economy with knowledgeable experts alongside key business and political players, the annual meeting of the forum now features the top political topics of the day appearing in media, such as global climate change and AIDS in Africa. Faculty member Steven Strauss at the Harvard Kennedy School, have pointed out that many of the WEF's strategic partners (who in return for financing the annual meeting have the ability to set the intellectual agenda for the meeting) have been convicted of serious criminal, civil, or human rights violations, raising significant questions about the forum's legitimacy as a neutral convener on certain topics. The Public Eye Award, a former counter-event to the WEF. The Public Eye Awards have been held every year since 2000. 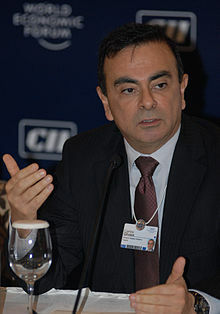 It is a counter-event to the annual meeting of the World Economic Forum (WEF) in Davos. Public Eye Awards is a public competition of the worst corporations in the world. In 2011, more than 50,000 people voted for companies that acted irresponsibly. At a ceremony at a Davos hotel, the "winners" in 2011 were named as Indonesian palm oil diesel maker, Neste Oil in Finland, and mining company AngloGold Ashanti in South Africa. According to Schweiz aktuell broadcast on 16 January 2015, a public presence during the WEF 2015, may not be guaranteed because the massively increased security in Davos. The Public Eye Award will be awarded for the last time in Davos: Public Eyes says Goodbye to Davos, confirmed by Rolf Marugg (now Landrats politician), by not directly engaged politicians, and by the police responsible. "Davos Man" is a neologism referring to the global elite of wealthy (predominantly) men, whose members view themselves as completely "international". Davos men supposedly see their identity as a matter of personal choice, not an accident of birth. According to political scientist Samuel P. Huntington, who is credited with inventing the phrase "Davos Man", they are people who "have little need for national loyalty, view national boundaries as obstacles that thankfully are vanishing, and see national governments as residues from the past whose only useful function is to facilitate the élite's global operations". In his 2004 article "Dead Souls: The Denationalization of the American Elite", Huntington argues that this international perspective is a minority elitist position not shared by the nationalist majority of the people. John Fonte of the Hudson Institute has suggested that the transnational ideology of Davos Man represents a major challenge to Francis Fukuyama's assertion that liberal democracy represents the fulfillment of The End of History and the Last Man. Since 2011, the World Economic Forum has been addressing its very own gender quota, to introduce at least one woman for every five senior executives that attended. Female participation increased from 9% to 15% between 2001 and 2005. In 2016, 18% of the WEF attendees were female; this number increased to 21% in 2017. Hernando de Soto Polar of the Institute for Liberty and Democracy attributes a similar concept to Fernand Braudel, referring to it as the "bell jar". Although internationally connected, each country's elite lives in a bell jar in the sense of being out of touch with its own populace. Their isolation fosters a tendency to be oblivious to the fate of their fellow citizens. Lawrence Summers refers to this concept as the "stateless elites", tied more to the success of the global economy than to any nation, and views it as eroding support for continuing globalization. ^ "Press Release: World Economic Forum Gains Formal Status in Switzerland". 23 January 2015. ^ "World Economic Forum: Our Mission". ^ a b Pigman. pp. 41–42. ^ a b c Hassan, Aisha (23 October 2018). "The organizers of Davos want nothing to do with Saudi Arabia's "Davos in the Desert"". Quartz. Quartz Media. Retrieved 24 October 2018. ^ "World Economic Forum Objects to Misuse of the 'Davos' Brand" (Press release). World Economic Forum. 22 October 2018. Retrieved 24 October 2018. ^ a b Jakab, Spencer (22 October 2018). "The Davos of Public Relations Disasters". The Wall Street Journal. Dow Jones & Company. Retrieved 24 October 2018. ^ a b Bosley, Catherine (22 October 2018). "WEF Condemns Use of 'Davos' Label One Day Before Saudi Summit". Bloomberg News. Retrieved 24 October 2018. ^ (registration required) "Interview: Klaus Schwab" Archived 4 June 2009 at the Wayback Machine.Financial Times. 22 January 2008. Retrieved 29 August 2008. ^ Lowe, Felix (14 January 2008). "WEF and Davos: A Brief History" Archived 3 April 2008 at the Wayback Machine. The Telegraph. Retrieved 25 January 2011. ^ Keaten Jamey, AP (13 January 2016). "World Economic Forum revokes invitation to North Korea to attend the annual meeting in Davos" Archived 11 October 2016 at the Wayback Machine. U.S. News & World Report. Retrieved 14 January 2016. ^ AFP (15 January 2016). N. Korean fury over 'sinister' WEF Davos forum exclusion Archived 7 October 2016 at the Wayback Machine. The China Post. Retrieved 15 January 2016. ^ P. S. Goodman (2017). "In Era of Trump, China’s President Champions Economic Globalization". The New York Times (News Analysis). Retrieved 17 January 2017. ^ Livemint (2018-01-23). "WEF Davos 2018 highlights: Narendra Modi warns of three global threats". livemint.com/. Retrieved 2018-02-08. ^ Speech by the President of the Republic, Jair Bolsonaro, at the Plenary Session of the World Economic Forum – Davos, Switzerland, January 22, 2019. Brasil. Ministry of Foreign Affairs. Retrieved 22 January 2019. ^ Taylor, Chloe (Jan 2019). Global tension is hampering our ability to fight climate change, Davos survey warns CNBC. Retrieved 22 January 2019. ^ "New Forum Center to Advance Global Cooperation on Fourth Industrial Revolution". World Economic Forum. Retrieved 2016-11-20. ^ "The Leadership Team | World Economic Forum-The Leadership Team". Weforum.org. Retrieved 22 January 2012. ^ "World Economic Forum, Leadership and Goverance". Retrieved October 16, 2018. ^ "World Economic Forum, Governance and Leadership". Retrieved October 16, 2018. ^ "Members | World Economic Forum-Members". Weforum.org. Retrieved 22 January 2012. ^ "The Truth About Davos: Here's Why People Happily Pay $71,000+ To Come – And Why They'll Keep Paying More Every Year". Business Insider. January 26, 2011. ^ "Sky-high Davos summit fees leave multinationals feeling deflated". The Financial Times. October 10, 2014. ^ Staff writer (26 January 2009). "Q&A: World Economic Forum 2009" Archived 23 September 2016 at the Wayback Machine BBC News. Retrieved 25 January 2011. ^ Weber, Tim (26 January 2010). "A Beginners' Guide to Davos" Archived 23 September 2016 at the Wayback Machine BBC News. Retrieved 25 January 2011. ^ "Forum Closes with Call to Action: Globalize Compassion and Leave No One Behind". January 26, 2018. Retrieved October 16, 2018. ^ "Kanaal van WorldEconomicForum". YouTube. 31 January 2010. Retrieved 7 March 2010. ^ "World Economic Forum's Photostream". Flickr. Retrieved 7 March 2010. ^ "48TH WORLD ECONOMIC FORUM ANNUAL MEETING". World Economic Forum. Retrieved 22 January 2018. ^ founder Klaus Schwab's declaration that "the need for global cooperation has never been greater". 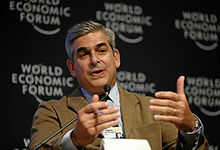 ^ "World Economic Forum 2011 Abridged List of Participants" (PDF). Retrieved 22 January 2012. ^ "World Economic Forum: The Inaugural Annual Meeting of the New Champions". China.org. Retrieved 29 August 2008. ^ Staff writer (1 August 2007). "Summer Davos To Put Dalian on Business Map". China Daily (via People's Daily). Retrieved 25 January 2011. ^ "World Economic Forum – Events". Weforum.org. World Economic Forum. Archived from the original on 9 January 2009. Retrieved 7 March 2010. ^ "Forum of Young global Leaders". Weforum.org. World Economic Forum. Retrieved 5 April 2013. ^ "Schwab Foundation for Social Entrepreneurship – Home". Schwabfound.org. Retrieved 7 March 2010. ^ Fruchterman, Jim (31 January 2005). "Davos Diary: Meetings of Minds" Archived 23 September 2016 at the Wayback Machine BBC News. Retrieved 25 January 2011. ^ "Issues | World Economic Forum-Issues". Weforum.org. World Economic Forum. Archived from the original on 1 December 2010. Retrieved 29 November 2011. ^ "WEF – Financial Development Report". World Economic Forum. Archived from the original on 18 August 2013. ^ Pigman. pp. 43, 92–112. ^ "Global Risks | World Economic Forum-Global Risks". Weforum.org. World Economic Forum. Archived from the original on 1 December 2010. Retrieved 29 November 2011. ^ Global Risk Report 2009 Archived 25 February 2009 at the Wayback Machine World Economic Forum. ^ India Brand Equity Foundation. "India Adda World Economic Forum at Davos" Archived 21 February 2014 at the Wayback Machine 2012. ^ Black, Richard (20 June 2008). "Business Chiefs Urge Carbon Curbs" Archived 23 September 2016 at the Wayback Machine BBC News. Retrieved 25 January 2011. ^ Szabo, Michael (19 June 2008). "Business Chiefs Call for G8 Climate Leadership" Archived 31 January 2009 at the Wayback Machine Reuters. Retrieved 25 January 2011. ^ Shaping the Future of Environment and Natural Resource Security The World Economic Forum Davos 2017. Retrieved 16 January 2017. ^ D. G. McNeil Jr (2017). Donors and Drug Makers Offer $500 Million to Control Global Epidemics. The New York Times. Retrieved 20 January 2017. ^ "New global initiative will help harness 4IR technologies tackle environmental issues". Waterbriefing. 21 September 2017. Retrieved 26 January 2018. ^ Casey, JP (25 January 2018). "Project to sequence all genomes on Earth to begin in Amazon rainforest". Drug Development Technology. Retrieved 26 January 2018. ^ "Global Future Councils". Global Future Councils. World Economic Forum. Retrieved June 11, 2018. ^ a b "Dubai to host second WEF annual meeting of Global Future Councils". Al Arabiya English. October 11, 2017. Retrieved June 11, 2018. ^ "Home, Centre for the Fourth Industrial Revolution". Centre for the Fourth Industrial Revolution. World Economic Forum. Retrieved June 11, 2018. ^ "World Economic Forum: a history and analysis". Retrieved 20 January 2017. ^ "Creating the Responsible Consumer: Moralistic Governance Regimes and Consumer Subjectivity Markus Giesler Ela Veresiu". Retrieved 21 January 2017. ^ Barret, Bernard (15 November 2000). "Beating Up – A Report on Police Batons and the News Media at the World Economic Forum, Melbourne, September 2000" Archived 26 September 2011 at the Wayback Machine. [Australian Politics]. Retrieved 24 August 2011. ^ Noon, Chris (21 January 2006). "Bono Teams Up With Amex, Gap For Product Red" Archived 8 September 2008 at the Wayback Machine. Forbes. Retrieved 25 January 2011. ^ C. Thumshirn (2017). Warum das WEF keine Demonstranten mehr anlockt(in German). Neue Zürcher Zeitung. Retrieved 17 January 2017. ^ Tibetans and Uighurs protest in Geneva. SWI swissinfo.ch (Politics-Conflict). Retrieved 22 January 2017. ^ Vara, Vauhini (January 2015). Critics of Oxfam’s Poverty Statistics Are Missing the Point. The New Yorker. Retrieved 27 January 2019. ^ Taylor, Chloe (January 2019). Richest 26 people now own same wealth as poorest half of the world, Oxfam claims cnbc.com. Retrieved 27 January 2019. ^ Webster, Camilla (22 January 2008). "The Davos Buzz" Archived 5 October 2016 at the Wayback Machine. Forbes. Retrieved 25 January 2011. ^ [dead link] "Police Arrest 100 Davos Protesters" Archived 23 March 2008 at the Wayback Machine. CNN. 28 January 2001. Retrieved 29 August 2008. ^ [dead link] "Tight Security Surrounds Davos"[permanent dead link]. CNN. 25 January 2001. Retrieved 29 August 2008. ^ Michel Liechti, Giovanni Arcudi, Marisa Vonlanthen, "Frontières entre police et armée" Archived 18 October 2016 at the Wayback Machine, Cahier du GIPRI, n° 2, 2004. ^ Davos stimmt ab - Mehr Geld für das WEF(in German) SRF.ch. Retrieved 23 January 2019. ^ "Open Forum Davos, Schweizerischer Evangelischer Kirchenbund". Openforumdavos.ch. Archived from the original on 2 February 2010. Retrieved 7 March 2010. ^ "Open Forum". YouTube. Retrieved 7 March 2010. ^ Gowers, Andrew (22 January 2006). "Davos: Beanfeast of Pomp and Platitude". The Sunday Times. Retrieved 25 January 2011. ^ Strauss, Steven (12 January 2014). "Why Do U.S. Politicians Meet With 'Criminal' Entities in Switzerland?". The Huffington Post. Retrieved 17 January 2014. ^ Lang, Olivia (28 January 2011). "BBC Davos Day three". BBC News. Retrieved 29 November 2011. ^ Gianluca Galgani: WEF ohne Kritiker Archived 4 August 2016 at the Wayback Machine. Schweizer Radio und Fernsehen, 16 January 2016. Retrieved 20 January 2015. ^ A. Gibbs (2017). As world leaders descend upon Davos, the gender debate rumbles on CNBC News. Retrieved 17 January 2017. ^ Summers, Lawrence (27 April 2008). "America needs to make a new case for trade". FT.com. Retrieved 20 June 2013. Bornstein, David (2007). How to Change the World – Social Entrepreneurs and the Power of New Ideas. Oxford University Press (New York City). ISBN 978-0-19-533476-0. 358 pages. Kellerman, Barbara (1999). Reinventing Leadership – Making the Connection Between Politics and Business. State University of New York Press (Albany, New York). ISBN 978-0-7914-4071-1. 268 pages. Moore, Mike (2003). A World Without Walls – Freedom, Development, Free Trade and Global Governance. Cambridge University Press (Cambridge, England; New York City). ISBN 978-0-521-82701-0. 292 pages. Pigman, Geoffrey Allen (2007). The World Economic Forum – A Multi-Stakeholder Approach to Global Governance. Routledge (London, England; New York City). ISBN 978-0-415-70204-1. 175 pages. Rothkopf, David J. (2008). Superclass – The Global Power Elite and the World They Are Making. Farrar, Straus and Giroux (New York City). ISBN 978-0-374-27210-4. 376 pages. Schwab, Klaus M.; Kroos, Hein (1971). Moderne Unternehmensführung im Maschinenbau. Verein Dt. Maschinenbau-Anst. e.V.. Maschinenbau-Verl (Frankfurt om Main, Germany). OCLC 256314575. Wolf, Michael (1999). The Entertainment Economy – How Mega-Media Forces Are Transforming Our Lives. Random House (New York City). ISBN 978-0-8129-3042-9. 336 pages. 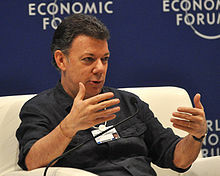 Wikimedia Commons has media related to World Economic Forum.